O God, who by the preaching of your blessed servant and bishop Ninian caused the light of the Gospel to shine in the land of Britain: Grant, we pray, that, having his life and labors in remembrance, we may show our thankfulness by following the example of his zeal and patience; through Jesus Christ our Lord, who lives and reigns with you and the Holy Spirit, one God, for ever and ever. 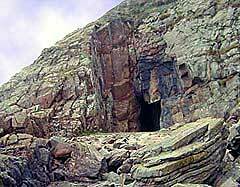 St. Ninian's Cave, near Whithorn, where St. Ninian first arrived in Scotland. Ninian is also called Nynia, Ninias, Rigna, Trignan, Ninnidh, Ringan, Ninus, or Dinan. He was a Celt, born in southern Scotland in about 360, and is regarded as the first major preacher of the Gospel to the people living in Britain north of the Wall--that is, living outside the territory that had been under Roman rule. He is said to have studied in Rome (note that he is contemporary with Ambrose, Jerome, and Augustine), but was chiefly influenced by his friendship with Martin of Tours, with whom he spent some considerable time when he was returning from Italy to Britain. It is probable that he named his headquarters in Galloway after Martin's foundation in Gall. Martin had a monastery known as LOCO TEIAC, a Latinized form of the Celtic LEUG TIGIAC. LEUG means "white, shining," and TIG means "house" (a shanty, or SHAN-TIG, is an old house). The suffix -AC means "little." Thus, Martin's monastery had a name which in Celtic means "little white house." At about the time of Martin's death in 397, Ninian built a church at Galloway, in southwest Scotland. It was built of stone and plastered white, an unusual construction in a land where almost all buildings were wood. He called it Candida Casa (White House) or Whithorn, presumably after Martin's foundation at Tours. Archaeologists have excavated and partially restored his church in this century. From his base at Galloway, Ninian preached throughout southern Scotland, south of the Grampian Mountains, and conducted preaching missions among the Picts of Scotland, as far north as the Moray Firth, He also preached in the Solway Plains and the Lake District of England. Like Patrick (a generation later) and Columba (a century and a half later), he was a principal agent in preserving the tradition of the old Romano-British Church and forming the character of Celtic Christianity. Some historians think that the number and extent of his conversions has been exaggerated, but throughout southern Scotland there are many and widespread churches that bear his name, and have traditionally been assumed to be congregations originally founded by him. See The Christian Island, by Beram Saklatvala (J M Dent, London, 1969), plus standard references.